Quality, long lasting nets that have been used in commercial tropical fish hatcheries for years. We have used a similiar net for over 15 years in saltwater and marveled at the durablity. Frames are made of quality 1/4″ solid aluminum rod. 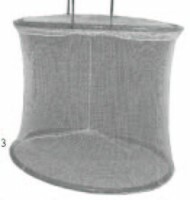 Net bags are made of 100% polyester knotless netting. Four meshes 1/64″, 1/16″, 1/8″, 5/16″ and 3/8″ (specify). 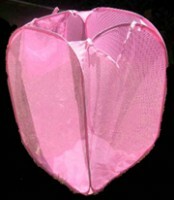 Bags are bow bottomed and come in 6″, 8″ or 10″ depending on net size. Handles are 12″, 18″ or 24″ (specify) long and made of heavy duty 1/2″ diameter PVC pipe with a hanging attachment. Handles are bolted to the frame with stainless steel bolts and clips which can be removed to replace the net. 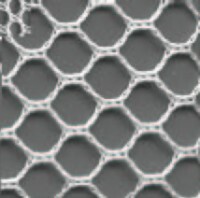 Removeable net guard included. Replacement nets are looped around the edge so the can be slipped over the net frame and glued or epoxyed in place if desired. Most nets and replacement bags will be in stock at all times. These nets are custom made by hand for Florida Aqua Farms in a small mountain village in Haiti that has no roads or electric. Our products are transported by hand to and from the village. Your purchase helps eleveate poverty and provide independent pride to these people. MAKE SURE TO SPECIFY DESIRED HANDLE LENGTH 12″, 18″ OR 24″.